Evans is challenging Senator Tamara Barringer for her NC General Assembly seat. So yet again, we Roy Cooper is siding with the bullies just like he has colluded with businesses to bully and blackmail our state over HB 2. 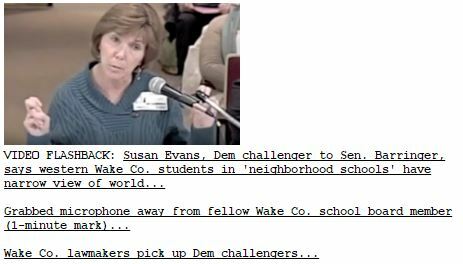 And yes, Susan Evans is a bully. I have first hand experience with her brand of intimidation public relations. Let me be clear: I’d sooner stick a white-hot poker in my ear than vote for Evans. Even if she was running for dog catcher. Evans had the nerve to snipe at me in person; she said I was being rude after I went over the generous 3 minutes to speak out about Common Core at a public education forum. A forum which was attended by maybe a dozen people. I am sure they were so put out having to listen to an additional 60 seconds of commentary. Those of you who know me personally know that I don’t suffer leftist bullies. 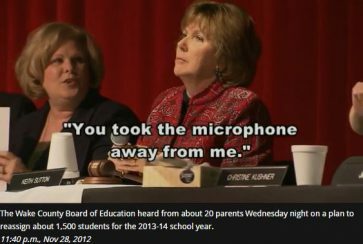 I told her where to stick her time limit since WCPSS’s board hadn’t even allowed for public comment on Common Core in the past. Revisit Ms. Evan’s bully past. Including her association with Moral Monday’s aptly nicknamed Bully Barber. What does this Roy Cooper endorsement say about a sitting Wake County School Board member? It arguably says she’s absolutely fine with putting Wake county students in harms way. This entry was posted in EDUCATION, EXCLUSIVE, LGBT, LL1885, Wake County School Board, You Will Be Made To Care and tagged HB2, Roy Cooper, Susan Evans, Tamara Barringer. Bookmark the permalink.